this blog will continue as an archive but all the posts, from the beginning in December 2007 up until the end of December 2010, are also housed at the new location. See you there. first, let’s throw out our usual qualifier: as I am not exactly in one of the world’s architectural hot-spots, my notion of what is over-exposed and trendy comes from the webinet and trade magazines. So this is not a list so much of the good and bad in the year’s architecture as it is a gleaning of the architectural press and their obsessions, good and bad over the last 12 months. This year definitely has seen an increase in the number of architect blogs – not the strictly professional type, but more personal. Replacing, or at least supplementing the design-candy pages of aggregator sites like materialicious, or the vaguely academic tone and personal remoteness of BLDGBLOG, these sites tend to discuss the nature of being an architect and have been heavily weighted toward the concerns of a profession in an economic and moral decline. I find these refreshing and a recognition that though we are architects, we are also human beings, and our thoughts, desires and concerns come to bear on our projects, not just our fancy educations and “natural born talent”. 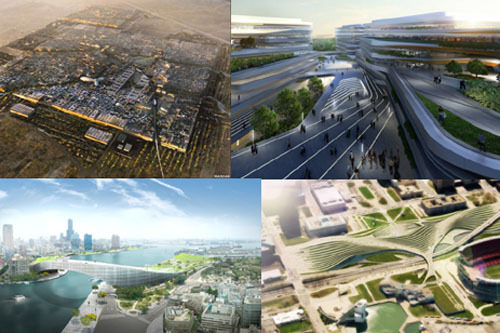 The most disturbing trend of the year, and I think a clear result of too many architects with too much time on their hands, has been the return of the megalopolis project designed by architects. In the late 1950’s and early 1960’s these ginormous projects were either horribly designed and generally racist urban renewal projects or architectural fantasies envisioning a utopic post-WWII world. They at least had some charm in their naivete’ as long as they weren’t actually built. When the were built, or partially so like Paul Rudolph’s Government Center in Boston, they more often than not displaced vibrant communities with dreadful environments. It has always been my belief that one of the most gratifying and positive outcomes of the critique of Modernism after this era was the realization that the will-to-power that these projects embody was the last death cry of a kind of technocratic fascism. Great places are made up of the small accretions of many buildings over many years, not planned by a few elitist experts and plopped down on the unsuspecting, and unsolicited, public. Lesson learned. One of the trends which has been increasing in 2010 is the frankly awful names that have sprung up for architecture firms. This was a subject of an earlier post, so I won’t dwell on it here, but I will be glad when the recession is over and architect’s can afford some quality graphic design and brand consultants to put an end to this. 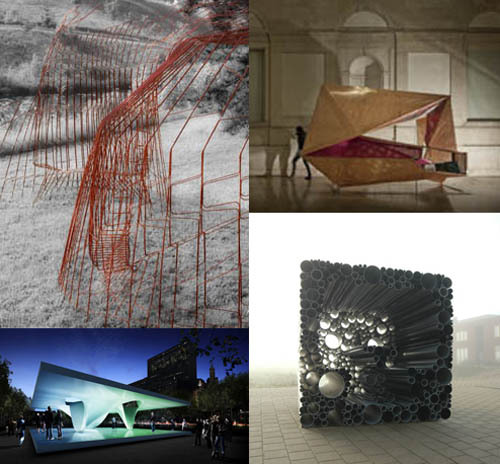 With the good comes the bad, and I think the pavilion as the ground for architectural expression and experimentation has a dark side as well. 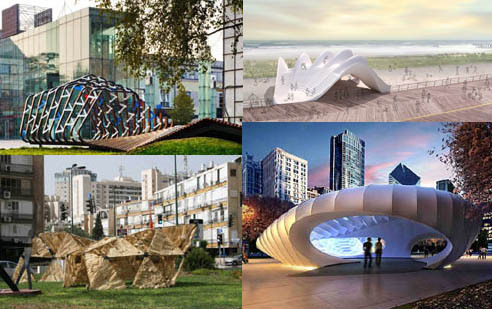 As I mentioned above, pavilions can be a great way for clients, be they cities or institutions, to try out the talent of young architects at a moderate cost and risk. However, just as many have been by well-established star-architects, like Zaha Hadid, and I think represent an ongoing trend of architectural consumerism. Call it a mini-Bilbao effect, but it seems like every city wants a star-architect building, and the recession has put an end to extraganzas like the Denver Art Museum by Libeskind and given us instead more affordable, and frankly disposable, star-architect pavilions. If it turns out that the city leaders don’t like it, trash it. If it leaks, no problem, it’s just a pavilion, it wasn’t really meant to last. I’m not knocking the architects who design these – they are given a project like a pavilion and they work at that. But we should not loose perspective that a fully functioning building places significantly more demands on its architecture than any pavilion. Pavilions are great architectural appetizers, but a meal they do not make. And, not to step up on the same old soap box once again, but the trade rags have continued in their appraisal of architecture as a merely visual phenomena to the exclusion of actually visiting and experiencing a building as something other than an eyeball. To some extent the exclusively visual analysis has begun to be supplemented by the usual slue of green stats – energy consumption, energy production, etc. However, for me this is still not even scratching the surface of the totality of what a building is, how it effects us, and what it may mean for us as individuals and a culture. How about talking to people who use the building and what it’s like to be there? Maybe too much work for architectural “journalists”? What is architecture? Why is architecture so undervalued? Do people want architecture? Are all architect’s educations fundamentally alienated from both the everyday practice of architecture and the needs and desires of people? I don’t know the answer to any of these questions and it may be a good outcome of the bad financial times that we are asking these questions. But frankly I fear some of the answers, none more so than the increasing speed at which people will feel the need and desire to throw architecture under the bus when even the whiff of economic hard times flutters by. On a cheerier note, the new year is upon us and with that will come a new form and format for this blog. We will be combining the blog with M. Gerwing Architect’s website and another blog to hopefully make a more cogent place for understanding architecture and our approach to it. And it looks way cooler too. Some time in the 1970’s, possibly as a rejection of the notion of the hero architect of recognizable name, firms began to make up names. The first I can think of was Superstudio, but a number of others quickly followed. This first wave of nuevo names were usually actual words or close variants and often explicitly called out their collaborative studio culture. In many ways this was not dissimilar to the wave of high-tech and pharmaceutical firms that adopted new words for identities to highlight their forward-looking natures and embracing of new technologies. Of late, maybe because the availability of words without some negative connotations have all been used up, architects have been opting for unique and odd spellings to set themselves off from the crowd. This is a particular affliction of Dutch architects from whom Mecanoo, OMA (“Office of Metropolitan Architecture”, not the principal’s names) and UNStudio are examples. When I see so many of these names I do not conjure up the image of a new, hip design firm but rather of so many kid’s toys. I probably have no right to kind of make fun of other architect’s corporate names when “M. Gerwing Architects” is so wrought with self-consciousness. I have worked for architects for whom the company name made no mention of the team that actually made the projects and I have worked for a firm whose made up name could have been used for a new software product or anti-depressant. But in all these places what has held true has been that the quality of work that came out of the office, collective or otherwise, was almost always the passionate and tireless effort of a real person. There may have been many hands that helped guide the project, but it was always the experience, judgement and vigilance of a single person that has brought a good project into a building. So M. Gerwing Architects is me. I am the M. No one calls me that, “M” is my own sort of joke – a laughing reflection that there is not a long string of famous architects named Mark. M is me, more typically called “Mark”, the “markitect” or “Daddy”. But by any name when a project is in the office it is worked primarily by me, not staff, and anything good or bad that happens on the project rests with me. I think people should hire architects, not architecture offices. And certainly not typographic experimentalists. Pronounced with an exaggerated accent on the final “e”, “poche'” is a French architectural term for the all the stuff that is inside the walls between spaces. In architectural drawings, it is the stuff blackened in on the plans. For typical construction where all the walls are about the same thickness and both sides run parallel to each other, poche’ isn’t really a design element. However, back in the days of predominantly stone masonry buildings, the thickness of stone walls gave them a relative presence that allowed for their manipulation as architectural entities. 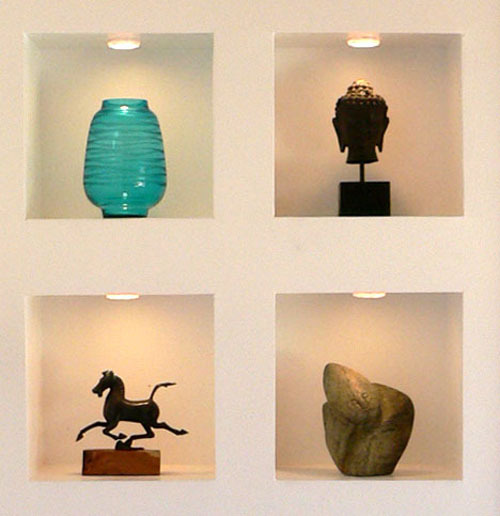 The simplest treatment of poche’ and the base cause of the terms use is when architects describe carving into a wall to create a niche. In those cases they may describe using the poche’ space of the building. In a sense, it is carving into the “solid” mass of the wall space even though in modern construction this space of the wall is certainly not stone or solid mass. 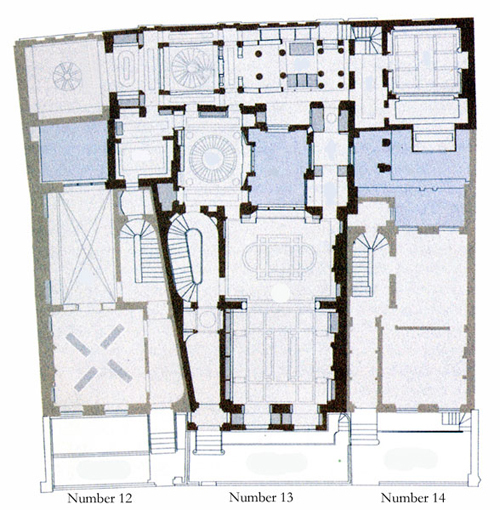 Baroque plans are especially rich in their interesting manipulation of poche’ to create geometrically shaped rooms. The resultant wall shapes between rooms, the poche’, takes on a presence that is as “shaped” as the rooms and certainly more interesting than simply the space between two wall surfaces. It is the odious time of year again when the spewing of year-end lists clogs the internets. So by all means, let me jump in with your help. If you have any particularly gruesome trends that you would like to skewer or slander, send them my way and I will try to distill these down to only the most dreadful. Individual buildings are always welcome, but what we are really looking for is trends, architectural fads, that have dominated the trade journals and publications, sucked the wind away from good, genuine work and will hopefully fade away as fast as Dubai towers projects. Send in your suggestions and our large and dedicated staff (I have actually lost weight this year so we are not so large as last), will compile them and try to present them back in a couple of weeks as the definitive list of the trends of 2010 we loved to hate. 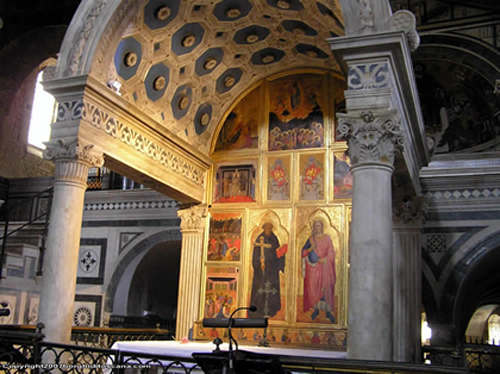 an “aedicula” is a term used to describe a small shrine within another building. As in the photo above, it typically is a multi-columned structure, open on three or four sides and serves to focus attention and define a smaller space within a much larger one. 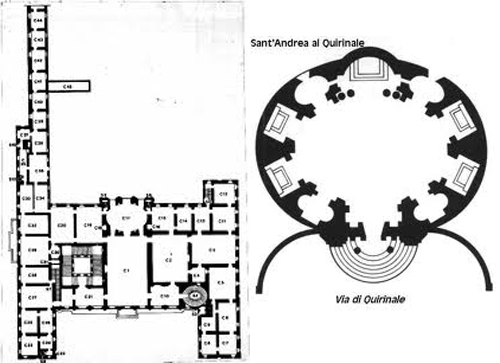 Over the years the religious dimension of an aedicula has diminished and it has become a term to define simply the formal structure of a columned little building within a larger space. 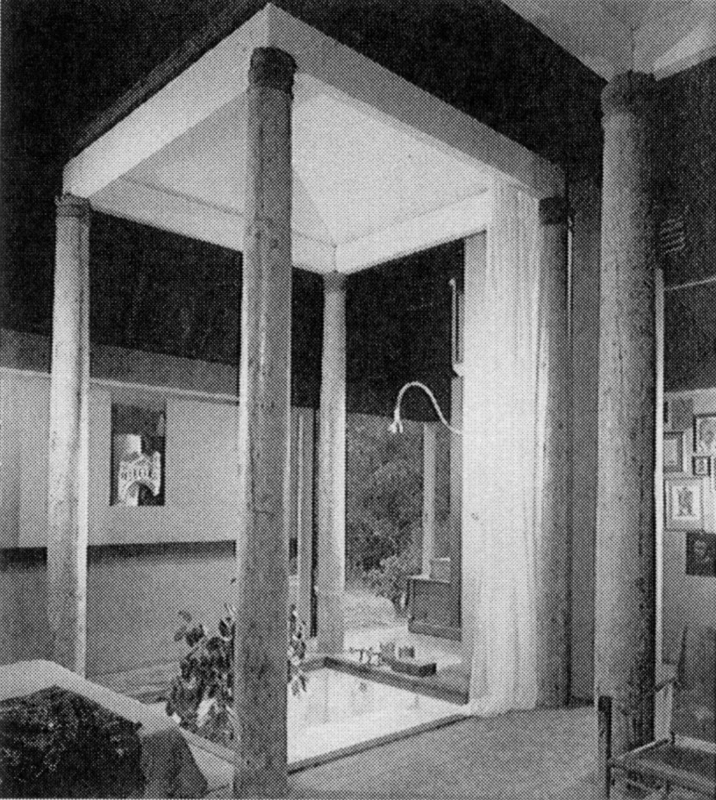 Because the aedicula focuses the space into a much smaller area of the room, it still in a sense, acts like a shrine, differentiating the small space and ceremoniously highlighting the space within. Of course the aedicula serves most of all to create a smaller, more intimate space while still being a part of the larger room. This type of construction has become more relevant in residential design as the desire for larger, more open living spaces has proliferated. Creating an aedicula within the family’s living space can celebrate what small function the family most honors being it a small reading space and library, a huge home theatre or, in the example above, the bath as a retreat. The small, tall buildings are individual houses and the city is divided into distinct neighborhoods, each with its own collection of civic buildings – police station, fire station, airport, library, and because this is Boulder: the recycling center and Humane Society. 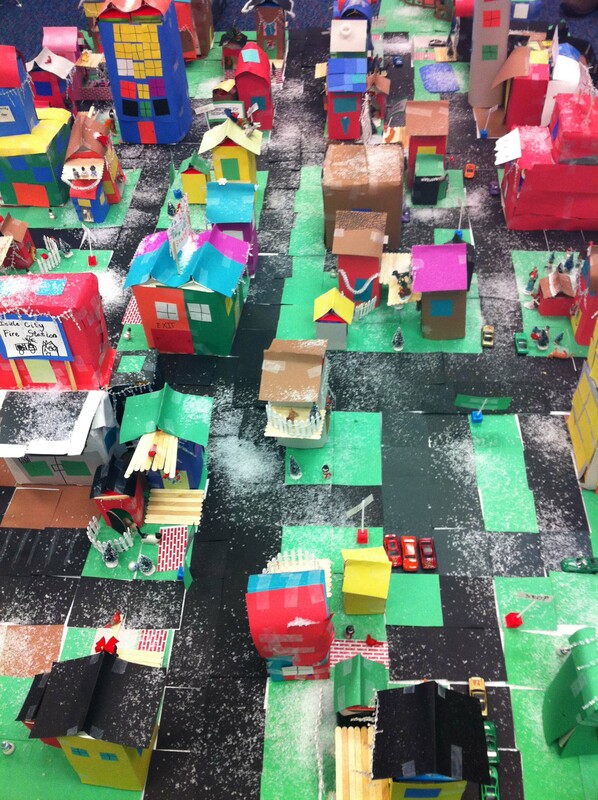 Actually the substructure of each building is a milk carton and the whole thing is a creative re-use project, making art (and urbanism) out of the collected used milk and juice cartons of the class.